** GP 27A / A27 12volt alkaline battery ** This listing is for 2 individual batteries. - For car alarm, car key, garage door remote controller, watch, toys, & many other electronic devices, etc. 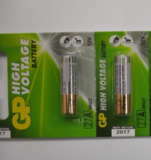 Check my other listing for other type of batteries. You are welcome to combine postage.